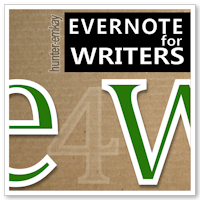 Over 2014 this website has been sharing some semi-regular posts on the subject of using free master notetaking app, Evernote, for writers. This is an index and explanation to those posts. If you haven’t yet tried Evernote, take the time to download and play with the app – it’s available as a web app, and for desktop and mobile. Click on the image below, and you’ll also have access to Evernote’s premium features for a month (the app is actually free). 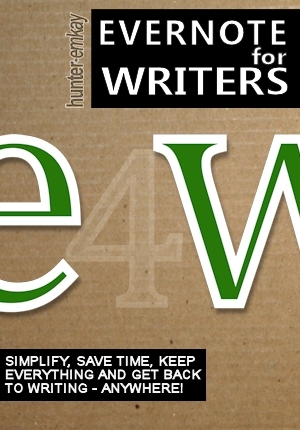 The Evernote for Writers posts can be recognised by the tags and category used (#E4W or #Evernote4Writers) or the logo (left) which appears at the bottom of all relevant posts. Journaling with Evernote Step by step on how to create and use a simple in-app diary notebook within Evernote, and a rundown of some of the best third party device apps which integrate with Evernote. Using Evernote for a Quote, Excerpt or Citation Collection Step by step on setup and collecting quotes or citations into Evernote. Using Evernote to Keep Track of Writing or Creative Submissions Step by step and walkthrough of linked notes and reminders in Evernote. Mohiomap your Evernote Review of a web-based mindmapping app which takes your Evernote or Dropbox files/notes, and maps them out in a virtual diagram. Evernote Webclippings Walkthrough of the many options to clip your research data into Evernote, from desktop browsers, Clearly, and mobile/tablet browsers. And third party apps. Reading Offline with Evernote Part of a post on apps for reading web articles and everything else offline, this features how you can use Evernote for reading PDFs offline. Note-taking Apps and Alternatives to Evernote A review and compare of the features of Evernote, OneNote and several others. Write Yourself a Time-Capsule Letter in Evernote Send yourself an inspiring letter from the past, using Evernote’s reminder function.